This particular story clearly suggests that wolves are capable of learning to do thing that dogs do. However, they do them at their own pace and do not respond well to being forced. I seriously doubt that anyone could force-fetch this wolf– and still have all of his fingers! The truth is this animal learned through the example of Junie and the trust he had in the Smitses. Very few wolves in captivity are kept in this fashion. Most people who keep wolves try to either keep in a way that they behave as naturally as possible. Those studies that have tried to keep wolves exactly like dogs in urban environments have also discovered that they can’t be forced to obey in the same way. They are also less interested in learning from people than Western dog breeds. But I don’t think they have tested wolves that have been raised with Western dogs on their ability to learn from the dogs. In this case, you have a dog from an easily trained Western breed. Because the Smitses were operating in Michigan’s Upper Peninsula, I am assuming that Junie was an American water spaniel, which is the regional retriever. This breed has been bred for many generations to work closely with human handlers, and because it is a retriever, the tendency to bring back objects to its handler is a trait for which it has been selectively bred for many generations. Although it the trait must be refined through training, it is very easy — in relative terms– to teach a water spaniel to bring back a duck without plucking it or trying to consume it. This wolf just happens to like the water spaniel, which is likely an elder. In wolf society, pups learn from their elders. They learn which prey they are supposed to hunt, and they learn how to use their predatory motor patterns to catch prey within a cooperative pack. This wolf learned from the water spaniel that the way one uses its motor patterns is to run out, pick up a wounded or dead duck, and come running back to the humans. I bet that one could train certain wolves to do this behavior, even without the water spaniel as the mentor. I bet that some wolves could even learn to ignore gun shots near them. However, training a wolf doesn’t mean that you just force yourself onto them, which unfortunately seems to be the paradigm in which most people operate regarding wolves. It is unlikely that anyone was able to domesticate a wolf by dominating it, for if you actually read the wild wolf literature, extremely aggressive dominance displays between individuals ultimately lead to the dispersal of one of the wolves. In captive situations, there is no dispersal, and those that don’t get along wind up doing a lot of fighting and displaying– which is assumed to be natural behavior. If paleolithic hunter-gatherers tried this on their camp wolves, they wouldn’t stay around for very long, and a certain percentage of them tend to wander off at mating season anyway. One of the real problems in comparing wolf and dog behavior is that researchers often use the popular Western dog breeds, which are often gun dogs and herding breeds, and northern wolves, which are actually quite specialized wolves. These two animals are going to have extreme differences in behavior. This type of wolf is going to be naturally quite cued into other canines, while the dogs are going to be very, very cued into people. There is a huge debate about whether wolves are smarter than dogs, which has been re-ignited when Eotvos Lorand University’s Department of Ethology began doing these comparative cognition studies with wolves and dogs. It is often said that wolves are capable of observational learning and that dogs can learn only by association, but dogs are actually capable of learning from both people and other dogs. I am of the view that no wolf, no matter how well-socialized, will ever be able to perform at the level of a gun dog or a herding breed when it comes to word and body language associations from humans. There will never be a wolf like Rico the border collie. Dogs are also able to get a lot more information because they are willing to learn from us– and they basically have to. There is probably a genetic basis to this difference, but we haven’t actually found it. But there aren’t enough wolves living as intimately with people as dogs do, so we really have problem making generalizations about wolf behavior. And because we have such a relatively low n in these studies, we probably aren’t going to be able to answer the question about which animal is more intelligent– if that is even a proper scientific question to work with in the first place. Wolves are just very hard to keep in domestic situations. They are too emotionally reactive– likely the result of the selecton pressures on their populations that came from centuries of persecution– and they are too energetic. The Russians say that “A wolf is kept fed by its feet,” which means that wolves are meant to travel vast distances every day in search of prey. In a home, this animal will be like a field-bred pointer, a foxhound, or Dalmatian. It will be so full of pent up energy that it might have a hard time focusing when the person arrives home to do some training with it. But the story of Big Jim shows that at least some wolves are capable of learning to do dog behaviors. I don’t think we’ve figured out what the big differences between dogs and wolves actually are. I certainly don’t think we’ve figured out which species is more intelligent. However, I do think the dogs from Western breeds that have been bred to work closely with handlers that live very closely with people have some traits that are very unique, and most household dogs are going to receive a wealth of information from humans that even a very socialized wolf might not be open to learning. 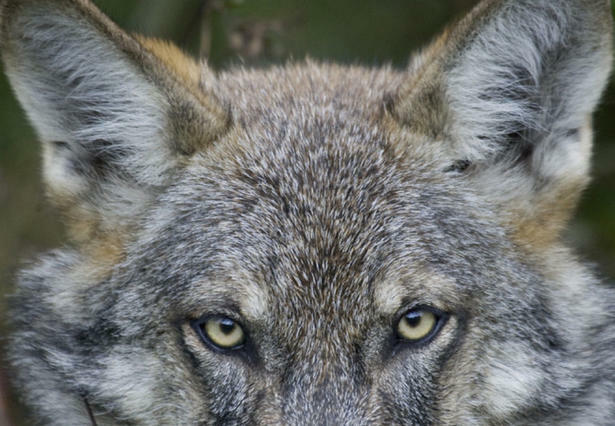 It may be the result of nothing more than the much higher emotional reactivity and energy levels on behalf of the wolf, but it may be something fundamentally cognitive. I don’t think we have the answers yet. Minong is the Ojibwe word for Isle Royale, an island in Lake Superior off the coast of Michigan’s UP. The Smitses were operating in Rock Habor, Michigan, which is the harbor that provides access to Isle Royale. 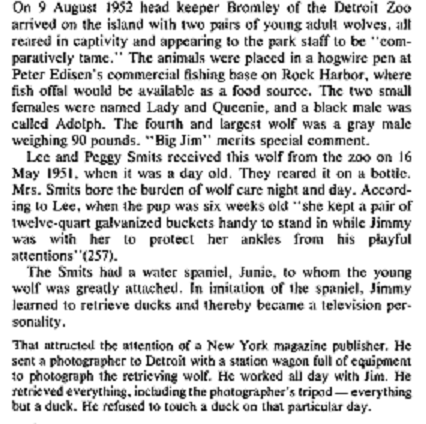 The Smitses were raising captive wolves to introduce to Isle Royale, but this proved to be a major problem. These imprinted wolves often approached people when they came to the island to camp, and all the wolves but Big Jim wound up being shot. Big Jim wandered the island for several years after that, but it is unlikely that he contributed any genes to the current wolf population on the island. Great analysis and comparison of learning behaviour between wolves and dogs. On another note, Junie must have been a great little Brownie to have made an impression on Big Jim. It would have been easier for a Chessie, but Brownie – awesome!